Proven Durable, Tough, and Resistant. that stops chemical spills every time. thickness is required for a positive seal. seal against irregularities around any drain. weight has never been duplicated by anyone. The Original. 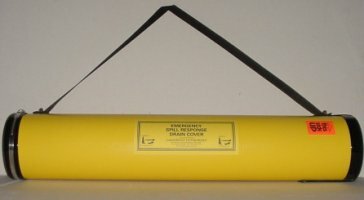 Introduced in 1992 as the first positive sealing drain protector, the DrainProtector immediately became the standard for the spill control and hazardous waste industry. Chemically Resistant. 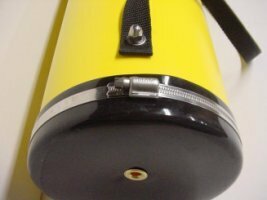 The urethane DrainProtector is compatible for use with a wider range of chemicals and substances than rubbers and plastics. It is often more suitable when coming into contact with certain solvents, oils, and chemicals. Plus, it's environmentally safe. Easy to Use. 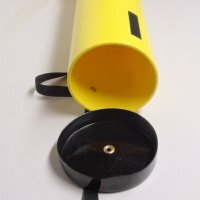 A unique engineering process allows the DrainProtector to be heavy enough to seal, yet light enough to be portable and easy to use. Reusable. After using, simply wash the DrainProtector, replace its plastic film, roll it on its tube, and return the tube to its container. It's tough enough to stand up to repeated use. Large Stock. The DrainProtector is availabel in several standard sizes and shapes to meet a wide variety of job site requirements. 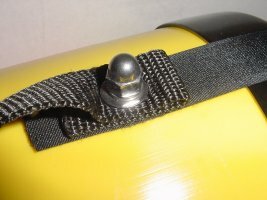 Plus, DrainProtectors can be custom cut to your specifications at the manufacturer's US plant. Conveniently Available. The DrainProtector is available directly from your local distributor. For sizes, prices, and custom orders, contact us today. Hold and store your Drain Cover between uses. Easy Access! High Visibility! Hazmat Yellow! Easily hung on optional wall mounted holder. Durable carrying strap makes it handy and portable. Ready for use at any time!